If you have blemish prone skin, you’ll want to know every weapon available in the fight to reduce breakouts! 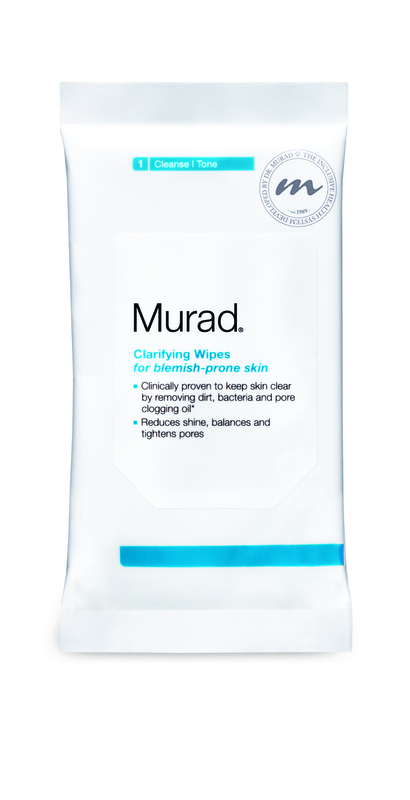 While there are dozens and dozens of everyday skin care and Inclusive Health™ tips, the team at Murad recently came up with two more you may have missed. Anything that touches your face can result in causing Acne Mechanica, which is the sciencey term for blemishes caused by things that come into contact with your skin. For example, people who get back blemishes can reduce breakouts by being careful about the fabrics they wear or by being mindful about using backpacks. If you wear glasses to improve your vision, or sunglasses to reduce glare and protect from wrinkles, then those glasses are touching your skin constantly. Even more importantly, the centre of your glasses is touching your skin right in the middle of the oily and breakout-prone T-zone area. Oil and dirt easily builds up on glasses and is transferred on to skin, clogging pores and causing blemishes. The solution? Make sure to wipe your glasses or sunglasses regularly to avoid transferring pore-clogging elements to your skin! These wipes are great for people on-the-go! They can be used to remove dirt, residue and oil from your face throughout the day. You can also use them to remove dirt and bacteria from your glasses. When you have blemish-prone skin or frequent breakouts, the natural instinct is to cover up and hair makes a good shield. However, a thick fringe or long luscious locks can transfer dirt and oil to your face and cause more blemishes to appear. Another issue is the various gels, waxes and sprays that most of us use daily. Products made to make your barnet bouncy can be transferred to your face whenever it touches your hair and can clog pores, irritate existing breakouts and generally damage your skin’s health. So be brave! Keep your hair back from your face. It may mean that your breakouts are more visible, but it also means you’ll be minimising new blemishes. If you’re not used to having your hair away from your face, you’ll want something you can count on to minimise shine and even skin tone. This makeup primer does both while balancing oil production and maintaining skin health. To tackle persistent blemishes, we recommend combining both of the above tips with an effective blemish treatment regimen and an Inclusive Health™ lifestyle. This entry was posted in Acne and Spots and tagged Acne, Blemishes, inclusive health, Spots by muraduk. Bookmark the permalink.